One of my favorite places to visit in the Central NY area is the Sterling Renaissance Festival in Sterling New York. This is truly a fun place for the whole family! The Sterling Renaissance Festival is one of the oldest and most successful producers of professional interactive entertainment in the world. 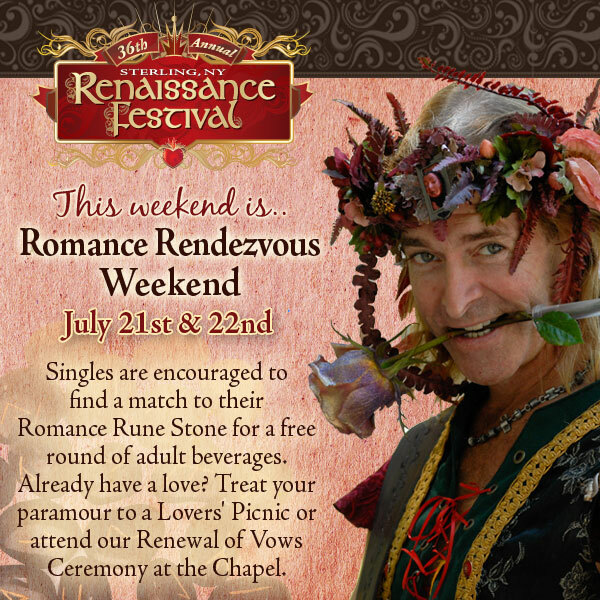 Thrill to the excitement of over 100 stage and street performers, professional actors, comedians and musicians who whimsically recreate an authentic English Renaissance village for you to experience. Join the merriment at the Pub Sing, Wench Auction and Trial & Dunke. Witness dozens of artisans demonstrating their fine craftsmanship and selling their unique wares. Enjoy digging into our savour delicacies - from steak-on-a-stake, pita pockets, succulent turkey legs, portabella mushroom sandwiches, mile high cakes and more! It’s the 36th year for the festival, which runs 10 a.m. to 7 p.m. Saturdays and Sundays through Aug. 19. Regular daily admission is $25.95 for adults and $15.95 for children ages 6 to 12. Season passes are $195.95 for adults and $95.95 for children ages 6 to 12. The grounds are at 15385 Farden Road in Sterling. Call 800-879-4446 for more information.